Do a Google image search of “Syria before the civil war” and you won’t find even 10 smiling faces on the first page. It hasn’t been easy for them and even break-hour discussions seemed out of context. We can’t possibly understand the fear and uncertainty that people in that part of the world are going through. We may sympathize, cry out, shout slogans, tweet or FB it but nothing will lead us to truly grasp the reality of the Syrian civil war and its impact. It was after one such discussion that I decided to look up some numbers on the Syrian civil unrest, specifically the casualties. Various sources had different versions and what struck me the most was the clinical manner in which the numbers were tabulated. I felt like the numbers could have easily been about the market share of smartphones or a list from a “Top 10” website. 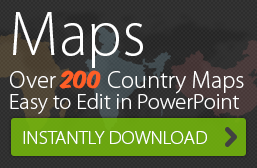 Being a visual person, I decided to map those numbers on our editable PowerPoint Syria map. I tried one and then a second option and then saw how bad it really was, now that I’d put the Syrian civil war casualties on the map. For the first option, I superimposed a bar graph with the figures over the map. That way, I could look at those numbers on the graph in perspective. This bird’s eye-view of the map with the graph in the foreground stood out starkly for me. Almost as if I was on a plane and seeing all the devastation and grief in numbers. For the second option, I created a range and a color coded legend. Since the icons already provided in the map deck are editable, I copy-pasted them with different colors as per the legend. This option gave me another perspective as I could see clearly which cities were the most affected and at what level. You will notice Rif Dimashq, which had 22709 reported casualties, Homs at 13345 and Idlib at 9934. At first glance, you may not be able to make much of it. But when you think that all of these casualties took place in less than three years, you will be shaken and driven to fervently wish that this unrest draws to a close as quickly as possible. As I was working these two maps, I wondered if people in Syria were hopeful. And even as I said “yes” out loud, my head involuntarily shook in disagreement. 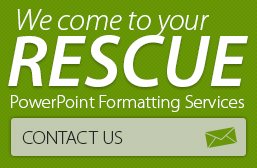 Learn more about using PowerPoint maps for your reports, websites and presentations.